At the staging area, riders who wish to donate $20 can pick up a “I’m Riding in Memory of . 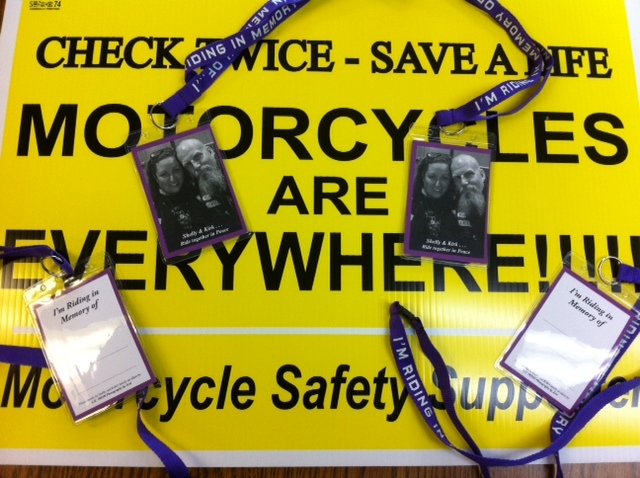 . . ” purple lanyard with a picture of Shelly and Kirk, as chosen by Shelly’s Mom Virginia, to help offset Pre-Ride coffee, after-Ride sandwiches, and replenish the Bikers Helping Bikers Massachusetts Motorcyclists Survivor’s Fund costs of purchasing Shelly’s Memorial Headstone, for the next family in need. See you at the ride, or click here to make a donation to the Fund in any amount.